Definition: The Oligopoly is a market structure wherein few sellers dominate the market and sell the homogeneous or heterogeneous products. Open Vs Closed Oligopoly: This classification is made on the basis of freedom to enter into the new industry. An open Oligopoly is the market situation wherein firm can enter into the industry any time it wants, whereas, in the case of a closed Oligopoly, there are certain restrictions that act as a barrier for a new firm to enter into the industry. Partial Vs Full Oligopoly: This classification is done on the basis of price leadership. 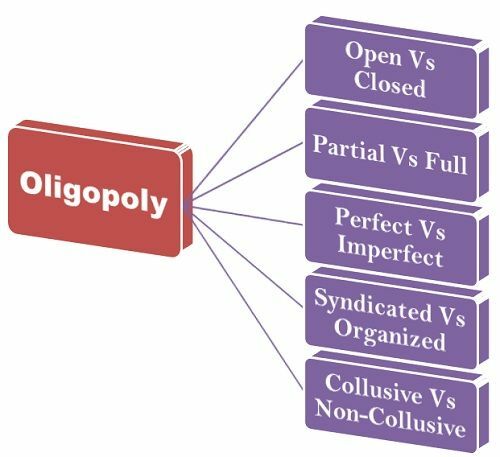 The partial Oligopoly refers to the market situation, wherein one large firm dominates the market and is looked upon as a price leader. Whereas in full Oligopoly, the price leadership is conspicuous by its absence. Perfect (Pure) Vs Imperfect (Differential) Oligopoly: This classification is made on the basis of product differentiation. The Oligopoly is perfect or pure when the firms deal in the homogeneous products. Whereas the Oligopoly is said to be imperfect, when the firms deal in heterogeneous products, i.e. products that are close but are not perfect substitutes. Syndicated Vs Organized Oligopoly: This classification is done on the basis of a degree of coordination found among the firms. When the firms come together and sell their products with the common interest is called as a Syndicate Oligopoly. Whereas, in the case of an Organized Oligopoly, the firms have a central association for fixing the prices, outputs, and quotas. Collusive Vs Non-Collusive Oligopoly: This classification is made on the basis of agreement or understanding between the firms. In Collusive Oligopoly, instead of competing with each other, the firms come together and with the consensus of all fixes the price and the outputs. Whereas in the case of a non-collusive Oligopoly, there is a lack of understanding among the firms and they compete against each other to achieve their respective targets. Thus, oligopoly market is a market structure that lies between the monopolistic competition and a pure monopoly.